Umesh Yadav starred with a match haul of 12 for 79 as defending champion Vidarbha routed Kerala by an innings and 11 runs on the second day of the Ranji Trophy semifinals. 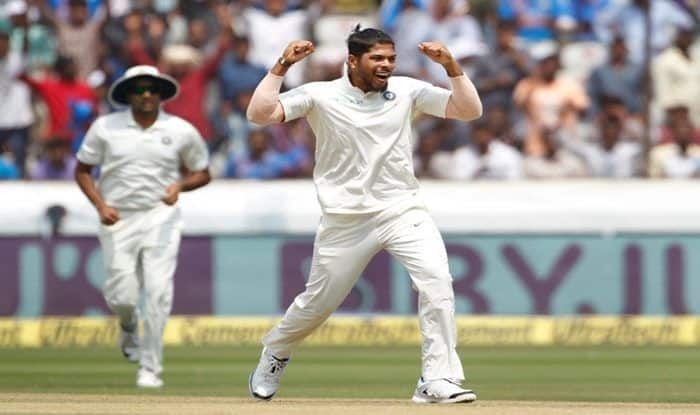 Pacer Umesh Yadav displayed a sensational performance with a haul of 12 for 79 to guide Vidarbha to a victory by an innings and 11 runs on the second day of the Ranji Trophy semifinal in Wayanad on Friday to reach the final for the second year running. Yadav added five wickets to his first innings haul of 7 for 48 as Vidarbha bundled out Kerala for 91 in the second innings to seal the low-scoring contest a little after lunch on the second day of the five-day semifinal. Resuming at 171 for 5, the defending champion finished at 208 all out in 52.4 overs to take the lead past the 100-run mark thanks to some lusty hitting by Yadav (17, 8 balls, 1X4, 2X6) at No.10. However, another poor batting performance by the host despite the bright start provided in the second innings by K B Arun Karthick (36, 33 balls, 5X4, 1X6) and Jalaj Saxena (7) resulted in a swift end to the proceedings. Yash Thakur proved to be the ideal foil for Yadav (5 for 31), taking 4 for 28 as Kerala collapsed from 59 for 1 to 66 for 7 in the space of five overs. After lunch, Yadav took two more wickets to complete the rout. Kerala had begun the second innings confidently, shuffling the batting order on a pitch which had something for the bowlers. Arun Karthick batted aggressively against Yadav and Rajneesh Gurbani. The plan worked for a while Yadav broke through, having Saxena caught behind by A Wadkar. Vishnu Vinod, who made the top score in the first innings, was pushed up the order to No. 3, but struggled against Yadav’s pace and movement, and edged one to the slip cordon. Yash Thakur replaced Gurbani and got Karthick with a delivery that came in. The run-out of captain Sachin Baby to a direct hit put Kerala in trouble. Loss of wickets at regular intervals didn’t help the home team’s cause as Yadav and Thakur kept striking one blow after the other. Yadav had on Thursday destroyed Kerala in the first innings with a seven-wicket haul and returned today to snuff out the host’s hopes of a fightback. Yadav had taken nine wickets in the quarterfinal win over Uttarakhand. Vidarbha awaits the winner of the other semifinal between Karnataka and Saurashtra being played in Bengaluru. Brief scores: Kerala 105 all out in 28.4 overs (Umesh Yadav 7 for 48) and 91 all out in 24.5 overs (K B Arun Karthick 36, Umesh Yadav 5 for 31, Yash Thakur 4 for 28) lost to Vidarbha 208 all out 171 for 5 in 52.4 overs (Faiz Fazal 75, Wasim Jaffer 34, Sandeep Warrier 5 for 57, Basil Thampi 3 for 64) by an innings and 11 runs.